Dr. Jennifer Johnson has been an active scholar-practitioner in the fields of college access and student retention. 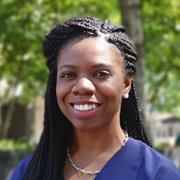 A former Philadelphia middle school teacher with a background in science and mathematics, she spent several years working as a counselor and advisor for college access and success programs. Broadly defined, her research areas include pre-college access programs, historically black colleges and universities (HBCU), students in science, technology, engineering, and math (STEM), and high-achieving students of color. This scholarship, both qualitative and quantitative in nature, examines intersections of race, class, and gender with a focus on how institutional contexts shape college access, experiences, and outcomes among Black students. In 2014, Dr. Johnson launched a large-scale qualitative research project focusing on the college choice motivations, collegiate experiences, and outcomes of HBCU alumni. Johnson, J.M. (2016). Managing transitions, building bridges: An evaluation of a summer bridge program for African American scientists and engineers. Journal for Multicultural Education, 10(2), pp. 206-216. Emerald Group Publishing Limited.